This document gives a high-level description of the production test process for atben and atusb boards, plus - in the case of atusb the production steps required between the boards leaving the SMT line and the actual testing. identify boards suffering from random production flaws and either discard them or prepare them for repair. 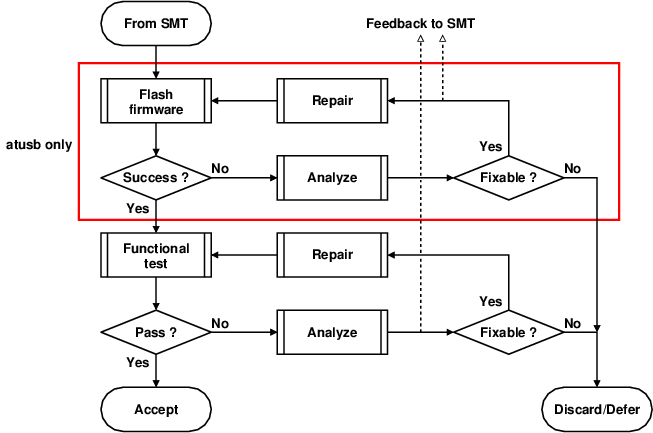 The results of testing and fault analysis also provide feedback for the SMT process and steps preceding it. Only atusb boards contain firmware and need flashing (which is a two-step process, see below). The functional tests and fault analysis are largely the same for atben and atusb. Devices accepted for further use can then be packaged for shipping. Defective devices can be discarded or retained for a deeper analysis. In this document, we assume that a single Ben is used in all three roles, with the board in its 8:10 card slot changed as the role requires. In this document, we assume that a single PC is used in all three roles, with one USB host port permanently connecting to the Ben, and a second USB host port populated with atusb boards as needed. Device Under Test. An atben or atusb board that has left SMT, and is being prepared for testing or is in the process of being tested. An atben or atusb device that is known to work and and that acts as a peer for RF communication with the DUT. In this context, the actual process of soldering components to the unpopulated PCB, and all related tasks providing an input to this process. Such related tasks include the configuration of the SMT line, and testing and conditioning of the components prior to soldering.